Cleanup. Cleanup sub-menu. (In previous versions this was in the view menu). Dance. (v7.5.0+) Starts/stops a force-directed layout of a Map view. Align Top Edges. Align the top edges of all selected items. Align Vertical Edges. 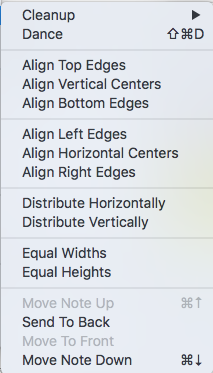 Align the vertical centres of all selected items. Align Bottom Edges. Align the bottom edges of all selected items. Align Left Edges. Align the left edges of all selected items. Align Horizontal Edges. Align the horizontal centres of all selected items. Align Right Edges. Align the right edges of all selected items. Distribute Horizontally. Distribute the selected items equally in the horizontal plane. Distribute Vertically. Distribute the selected items equally in the vertical plane. Equal Widths. Set selected items to the same width (largest in selection). Equal Heights. Set selected items to the same height (largest in selection). Move To First. In Map views this moves the current note in front of all other notes (i.e. first by outline order). Move Note Up. In Outline views this moves the current note up one place (at sibling level). Move Note Down. In Outline views this moves the current note down one place (at sibling level). Move To Last. In Map views this moves the current note behind all other notes (i.e. last by outline order).